Ateni beach in Andros Greece | Sea or swimming pool? Ateni beach is located in the northeastern part of Andros and is only 12 kilometres from Batsi. In fact, it is not one, but two sandy and stunning beaches. They are famous but also “protected” from the crowd. Their blue and crystal clear waters are preferred by people who do not want crowdedness but want isolation and tranquillity. 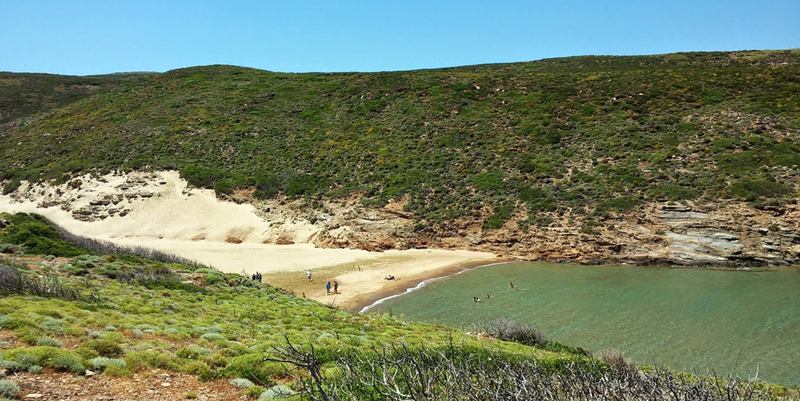 However, the complex of the two beaches that make up Ateni beach is attractive to every visitor of Andros, and fortunately, it is not difficult to approach. Take the main road from Gavrio to Chora, turn left to the junction near Batsi and head for the village of Katakoilos. Most of it is asphalted except the last 2 – 3 km of dirt road before the beach. It is easy, and it does not make it hard for drivers, whether they drive a jeep or a small car or a motorcycle. At Ateni beach you can feel at the same time swimming in the sea, but swimming in a pool as well. The waters have a beautiful blue colour and the surrounding hills are a unique decoration. The small Ateni beach looks very much like a pool, not only because of its hue but also because of its depth. It takes a lot of walking to swim in deep waters, and this makes it look like a natural, harmless water “playground”. Kids play for hours in the water, and the big ones are not afraid because the deep waters are too far away. So they can remain undisturbed to enjoy the summer.